I love Anthony Bourdain. If I could change places with anyone professionally speaking, it would be Tony. I’ve read all of his books on culinary subjects (he also writes fiction, which I have not explored) and watched all of his television shows across multiple networks. This book was my introduction to this larger than life, colorful guy. The book takes you on a tour of Tony’s life, from his childhood, spending Summers in France, throughout his tumultuous career to his work at Les Halles in New York. In the book, he speaks about his first trip to Japan, planting the seeds for his thirst for travel later in life. Tony took a lot of heat from the culinary world for writing this book due to his honesty regarding the industry. I admire him for his candid story. Society, particularly with the popularity of media like the Food Network glamorize chefs to a celebrity status. The reality is that what you see on TV and in glossy magazines couldn’t be further from the truth. Our industry is brutal, and unless you have a love affair with your work, you will burn out quickly. Tony paints a very realistic picture of what it is like to start out in the industry, make terrible career and life choices, and finally grow into a mature position of responsibility, all in a very humorous and entertaining manner. I believe that I like this book so much, because although the names are different, I can easily picture all of the crazy nut-jobs, colorful situations and unstable working environments that he describes. 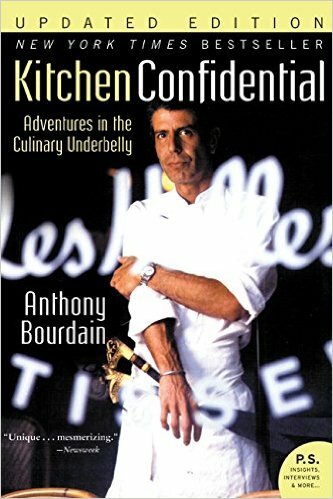 It is a shame that all culinarians aren’t gifted writers because anyone who has worked in the industry could write a book that parallels Kitchen Confidential. There are so many reasons to read this book. Any young person thinking about going into the industry should read this book (and work in a kitchen for a couple of years before committing). Whether you’re in the industry or not, the way Tony tells stories is brilliantly entertaining.